In just a few clicks, you can find gluten-free and peanut-free options nearby. Nima—the company behind the portable gluten and peanut sensors—is taking its mission to help diners with food allergies one step further. Today, the team launched a new map tool on their site that allows diners to search for restaurants in their area with allergen-free menu items. The map, which can be used to search for both gluten-free and peanut-free dishes, includes over 250,000 restaurant locations and 3 million "Nima-tested" dishes around the world, according to a statement. Here’s how it works: head to Nima’s homepage and scroll down until you find the search bar. In the field, you can enter a restaurant name or type of cuisine, desired location, and whether you’re searching for gluten-free or peanut-free restaurants (represented by wheat and nut icons, respectively). Once you hit search, a list of restaurants with allergen-safe menu items will populate—you can check out reviews and ratings, find directions, pricing information, and more. If you click on a specific restaurant, you’ll see on the left what percentage gluten-free and peanut-free the menu is, along with any reviews left by users certifying that a menu item is indeed allergen-free. 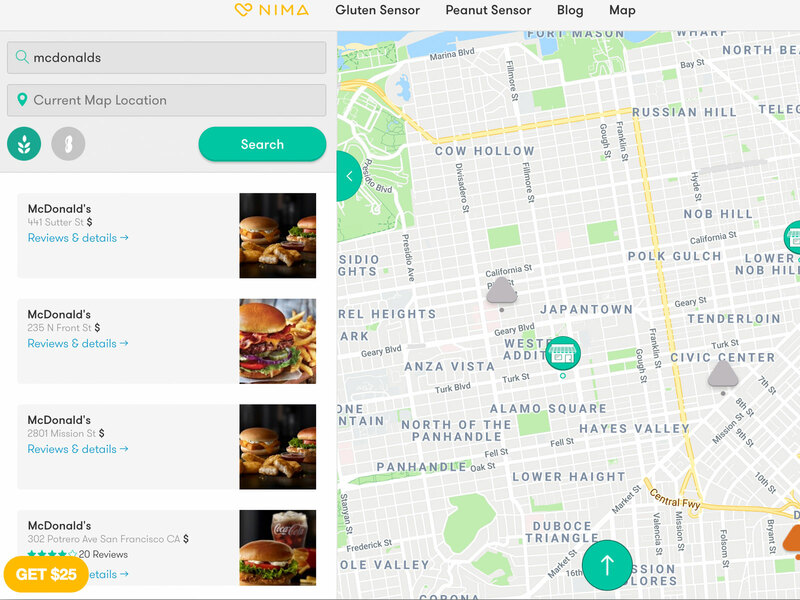 To verify the restaurants, the Nima team used their peanut and gluten sensors to test menu items from over 100 popular chain restaurants. Dishes that passed the test were added to the map, and, since chain restaurants often have the same menu across the board, additional locations for the restaurants were added to the map too. It's worth noting that while the tests for the tool were run on chain restaurants, you can also find non-chain restaurants on the map that were tested and verified by users. However, Nima does note that the allergen tests didn’t account for any cross-contamination at the restaurants—so keep a healthy level of caution when you’re dining out. Still, the map tool is definitely a step toward making restaurants less of a worry for diners with allergies.